All grade levels participate in community service projects throughout the school year. Some are school-wide projects such as a book or clothing collection. Individual grades often integrate a service activity into their lessons. In Seventh and Eighth Grades, students may elect to participate in the Trinity Service Corps as their trimester elective. 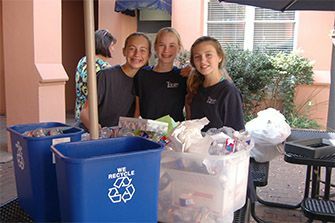 In addition, Middle School students participate in service learning in a variety of ways. Advisory groups have a strong focus on service, and groups participate in both on-campus and off-campus projects. Eighth Grade students spearhead the learning component of service by researching and presenting frequent public service announcements in Chapel to help educate the community about issues and needs surrounding our service work.